SWAMPSCOTT, Mass. — An elementary school principal in Massachusetts has announced in a letter that he identifies as a woman and will present himself as female going forward. 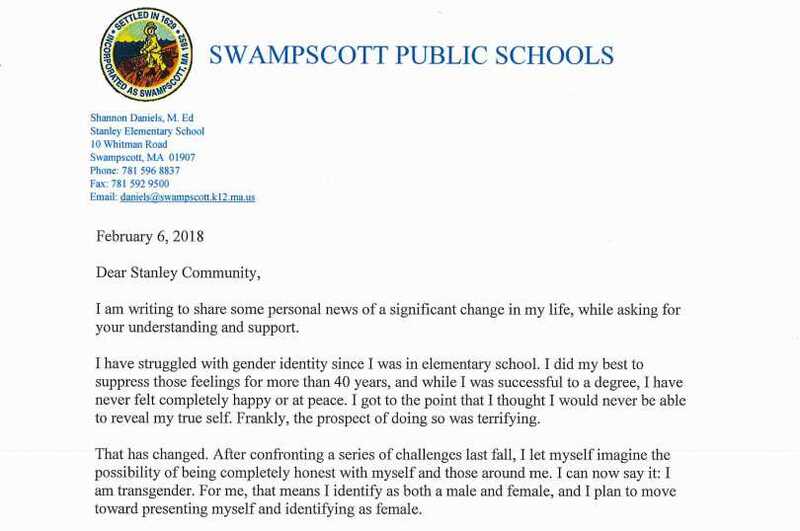 Principal Tom Daniels, who has led Stanley Elementary School since 2012, explained in the Feb. 6 correspondence that he has struggled with his gender identity from the time he was a youth, and has “never felt completely happy or at peace” with himself. He said that he has hid his struggle from the world for years. “I would respectfully ask that I be called Principal Daniels. When using pronouns to refer to me, ‘he,’ ‘she’ and ‘they’ are all acceptable,” Daniels stated. Superintendent Pamela Angelakis applauded Daniels and said she admired his transparency. However, commenters under The Salem News’ story expressed dismay over the situation. “What is wrong with this picture besides everything? Satan is the author of confusion. And this is in our schools? How insane,” one commenter wrote. “This is so wrong to be in our school systems. Totally unacceptable to force this on children!” another stated. “Public school is no place for a child,” a third opined. As previously reported, Scripture states that those who turn God’s creation “upside down” are like the clay telling the potter that he doesn’t know what he’s doing.